Still slightly obsessed with the fantasy of knitting these socks (I can't get them out of my head), I did a quick peruse of my 'abandoned' knitting projects, and found all of the above. Five 'one socks'. No matches were ever made for them, and as you can see, some never even made it to the full 'one sock' status. I don't want to think about how many more are out there--hiding amongst my yarn, or those that have already been frogged. Look at the purple and pink ones I started this summer--I've given up on them enough to take the needles out, but can't bear to unravel it! And more recently, the sock still on the needles was with a burst of sock inspiration (Knitting Iris did it to me--she makes me want to be a sock knitter!) I had just a month ago. I even tried a new pattern--the toe up. But alas, just barely past the toes and I decided I didn't like the colors, so there it sits. This, my friends, is why--with a heavy heart--I admit that I cannot make those fabulous over the knee holiday socks. Sigh. Here is the one lone 'pair' of socks that I've ever made. Booties, yes...lots of them. But socks...this is it. 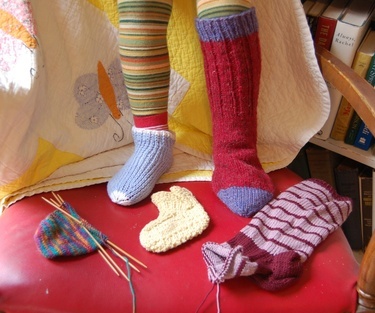 (Yankee Knitter Designs, Classic Socks. can't remember the yarn.) I do have to say that both of my boys have worn and loved them, so that should be enough motivation to start anew right there. C'mon...fess up. 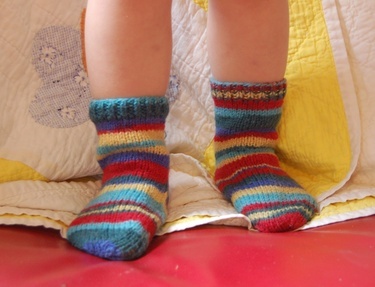 How many 'one socks' are hiding at YOUR house? I can't be the only one!